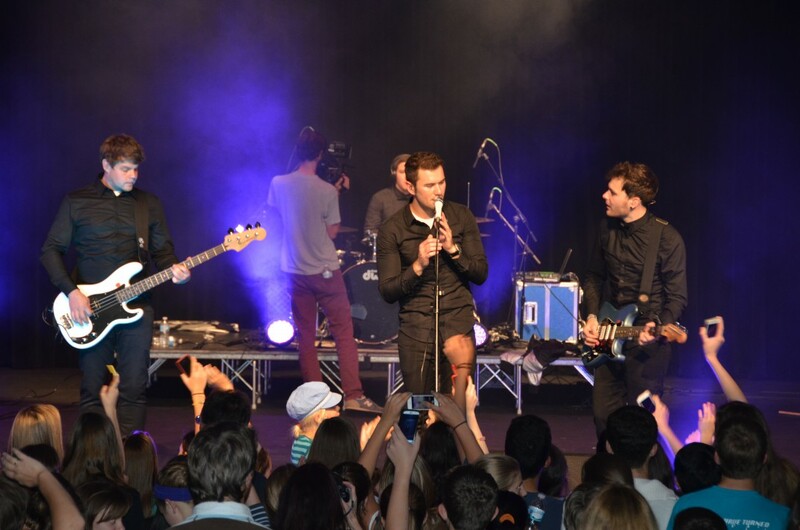 Maryland, Michigan, Pennsylvania, Virginia – 4 states, over 3000 miles of driving and lots of excited students, teachers and parents everywhere they went: that is the summery of Artig 3.0, the third US tour of the German rock band. 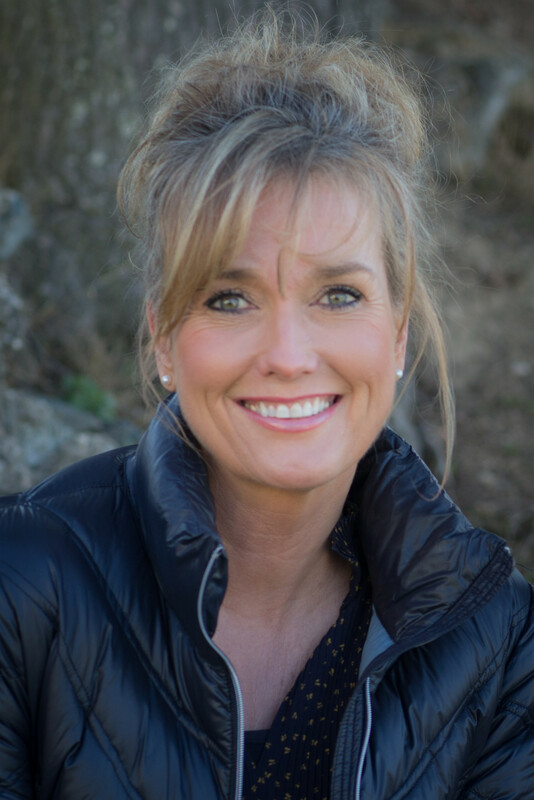 Overall they reached over 6000 German language learners, writes Kerstin Hopkins, GLC principal and tour organizer. 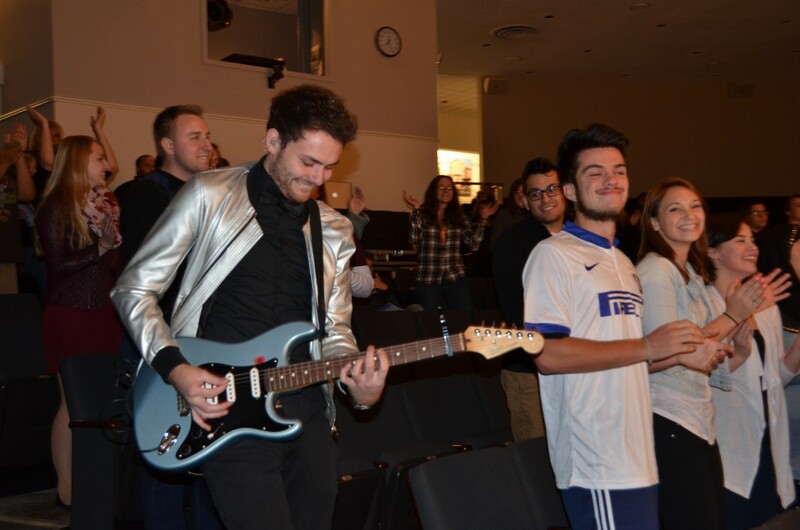 The tour started at the German Language School Washington with concerts on Friday evening and Saturday morning during the Oktoberfest followed by a lecture series from the band for 9th-12th graders of the German School. We drove from Washington to Michigan and met the camera and moderating team from Storyhouse Production on the Ohio Turnpike. Storyhouse covered the entire tour in Michigan for a Saturday morning show on RTL (“das große W” – Yolo Magazin) which will air in the beginning of 2015. Thanks to Storyhouse Production, Mr. Gutzeit, Michael Schmitt and his team for making this possible. In Michigan a great team hosted us for four days. A huge THANK YOU to Sabine Greiss, the Principal of the German Language School in Bloomfield and her team for being so generous and organized and for making these days unforgettable to the band and to us. Artig visited the German language classroom, talked to teachers, students and parents and gave some wonderful performances during these days. A tour to Motown Studios with 57 parents of German language learners and some insights of the City of Detroit will always be memorable. It was also great to be part of the 15th anniversary of the DSB. From Michigan our wonderful cars, sponsored by VW, brought us to Warminster, Pennsylvania. 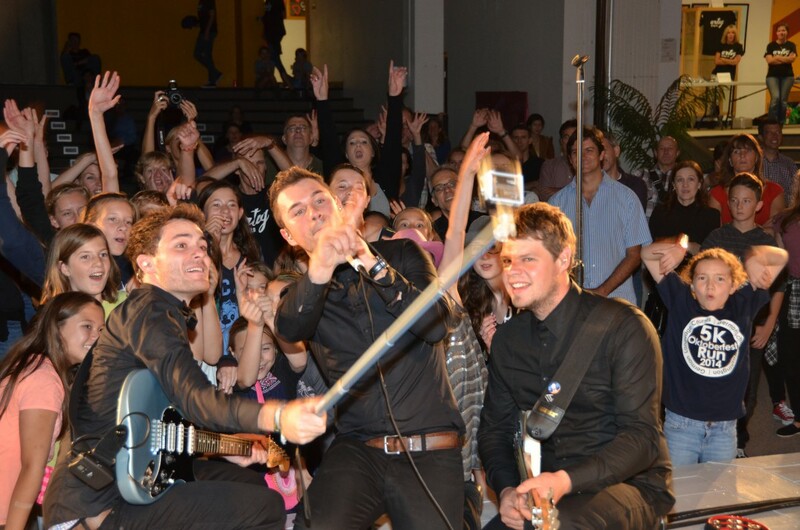 A small town with so many German language fans that were super excited that a band like ARTIG comes and visits them in rural PA which was the highlight of their school year. 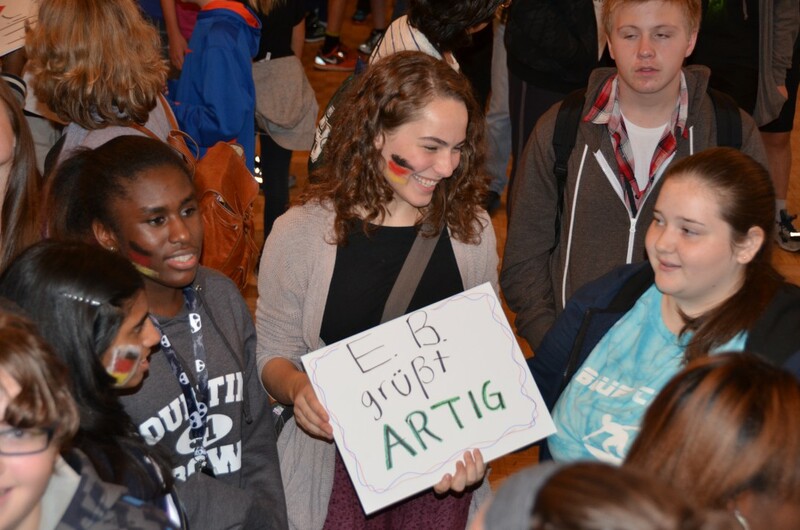 Buses arrived, students with ARTIG signs and German flags on their faces waited patiently in the hallways. Of course, we had to spend a few hours in Philadelphia to enjoy some Philly Cheese steaks before heading to Hood College in Frederick, Maryland. The German Professor, Dr. Scott Pincikowski, made this show happen within a few weeks’ notice. A beautiful auditorium, a great team of students and faculty awaited us when we arrived. The concert was a little smaller, but the atmosphere was spectacular. These students jumped out of their seats as soon as Artig hit the stage. No one was sitting and everyone was singing and rocking along. The hospitality afterwards was greatly appreciated. We packed all our stuff and came back towards our homes in Falls Church and Leesburg. Our host dad, AATG Vice President and German language teacher at Heritage High School, Hal Boland, greeted the band again at his house where all band members stayed when they were in town. The photographer resided with me in Falls Church. It was a huge support to host the band and the entire team privately to keep expenses down. A huge DANKESCHOEN to Mr. Boland who once again was so generous to everyone. We could not have done it without him! And now off to Stone Bridge High School in Loudoun County, VA!!! 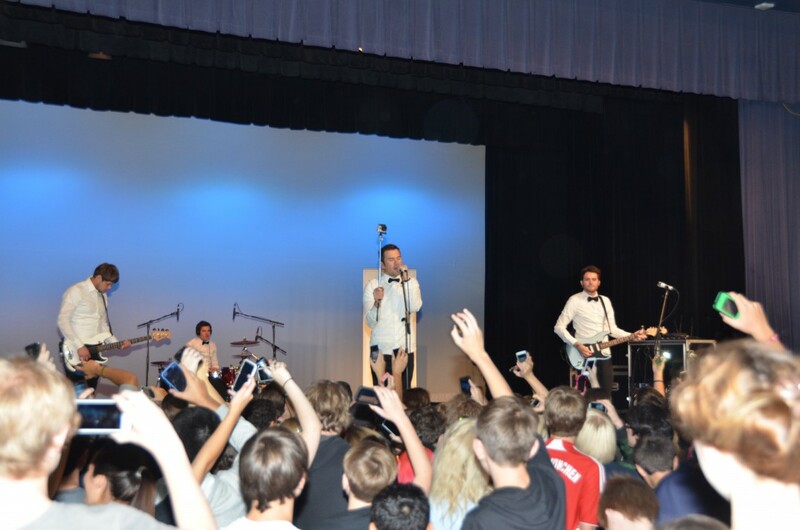 Laura Williams, German teacher at Stone Bridge pulled off a huge concert with over 1200 students on a Friday morning. She was greatly supported by her colleagues of Loudoun County. When over 14 school buses from all different High Schools arrived, we knew this will be a huge concert and a huge success. This concert was epic. Screaming students, a great auditorium, excited German language teachers and Artig rocked the house for almost two hours. Afterwards everyone wanted to meet the band and get an autograph. The meet and greet session with great food and a wonderful cake made the band feel very special. So many German teachers were involved and we thank everyone for their commitment and dedication! It was not easy to still stand on our feet after these two weeks of pure adrenalin rush, 3000 miles of driving and lots of excited students, teachers and parents. But we found a great way to calm down, relax and enjoyed an evening of home cooked foods, great company and wonderful conversations at “Casa Pertsch” in Washington, DC. Thank you so much for your hospitality. The following days were filled with downloading photos and videos, visiting German language teachers and German classes at High Schools and enjoying evenings at Laura Newell’s and Teresa Breitentaler’s house. Thank you both for welcoming and feeding the band and all the guests. We had a great time and hope that your children and their friends enjoyed the unplugged sessions with Artig. Last but definitely not least was the concert at McDaniel College in Westminster, Maryland. Dr. Mohamed Esa (AATG President and German Professor at McDaniel’s) was the organizer of the German-American Day at his college and Artig was part of this great event for German language learners and teachers. 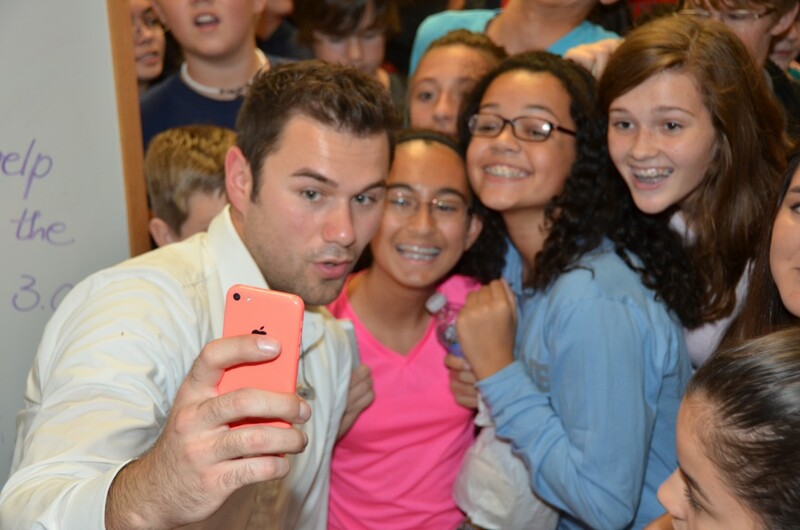 Again, over 1000 students joined Artig for their last concert of this tour. The dinner with Dr. Esa and his students on the evening before the concert was a great opportunity for these students to meet the band members and to talk about Germany. All Artig songs are in German. The lyrics, the music and their stage present were superb. We are convinced that we’ve reached many young students and advertised greatly for the German language and all German speaking countries. This tour was financed by the German Language School Washington (GLC), GLC fundraising projects, all participating schools and colleges, and the organizations listed above. Several sound companies offered great technical support and we would like to thank all of them, but in particular Klassic Sound who was very reliable and worked with us during five concerts. Thanks to Jan Hoffmann, the band’s sound engineer for his support. Thanks again to all sponsors. We are also pleased to announce that the Artig song “Lauf mit mir” was published in the “Musikbuch 2” (Cornelsen Verlag). VW Group of America also published a short video clip. Please become friends with Artig on Facebook or follow them on Instagram and Twitter. For more information, visit Artigs website. We are looking forward to ARTIG 4.0 in the near future and wish the band continued success. The entire tour was initiated and organized by Kerstin Hopkins, Principal of the German Language School Washington and her colleagues from several schools, and was sponsored by several organizations, such as Volkswagen Group of America, the Friends of the German School Washington, Storyhouse Production, Itemis, DAveEntertainment, Susanne Weers (Photographer) and Lauschangriff. Serveral private schools, colleges, and public schools offered and financed huge concerts with wonderful additional programs for the band, students and friends.